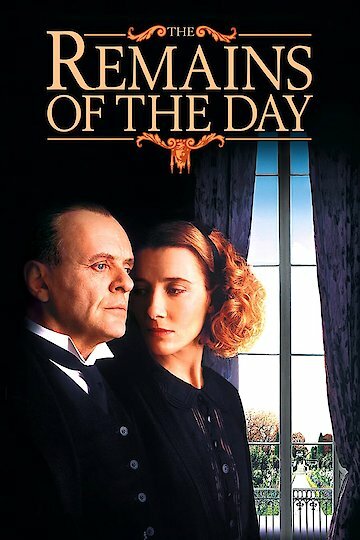 The Remains of the Day is a 1993 film based on the novel by Kazuo Ishiguro. Directed by James Ivory, it stars Oscar winner Anthony Hopkins as Mr. Stevens, the head butler in a British manor home. While told in flashbacks, the focus of the story takes place between World War I and World War II, where the arrival of housekeeper Miss Kenton, played by Emma Thompson, challenges Mr. Stevens’s stiff demeanor and rigid sense of household hierarchy. The film was critically praised for its nuanced portrayal of the tensions between upstairs and downstairs living and for its more pronounced conflict between Stevens’s sense of British loyalty and the sympathy his employer, Lord Darlington (played by James Fox), has for Nazi Germany. Also featuring Christopher Reeve, Hugh Grant, and Ben Chaplin, The Remains of the Day was nominated for eight Academy Awards: Best Picture; Best Director; Best Actor in a Leading Role; Best Actress in a Leading Role; Best Art Direction-Set Direction; Best Costume Design; Best Music, Original Score; and Best Writing, Screenplay Based on Material From Another Medium. The Remains of the Day is currently available to watch and stream, buy on demand at Amazon, Vudu, Google Play, FandangoNow, iTunes, YouTube VOD online.